Canada fishing is wilder than anything most folks have ever done before! Our guest Jeff recently sent us this story and we had to share it. If you don’t already have a fly-in fishing trip planned this year, it will make you want to book one. We had been trolling at Malaher that morning, pulling large baits for big Northern Pike. But Walleye kept hitting the large Pike lures. I decided to drop down a smaller lure on Myron’s lite Walleye rod to maybe entice the Walleyes into leaving the larger lure alone. 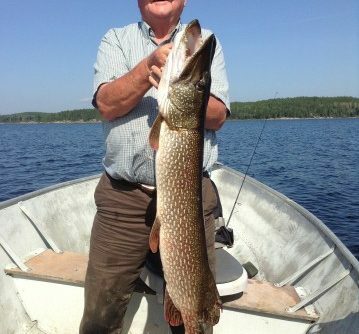 Of course – the large Pike immediately hit on that lite outfit! Myron had just gotten that walleye rod before the trip. Nice, lite, easy to handle with a very small matching reel. Myron had spooled it up with line but lost a good amount the first morning out. (Those reels don’t carry much line to begin with.) When the large Pike hit and started slugging out line, Myron got concerned because he was quickly running out of line! I kept the boat motor running and would slip it into gear and follow the fish when the wraps of line on the reel ran down to three or four. Otherwise, we stayed abreast of the fish and patiently let the bend of the rod wear the fish down. First time to the boat and the size seen, we let him run out again and continued chasing him. Second time’s the charm, as I had the net deep down in the water and waiting while Myron worked the fish up. It swam right into the net. A 25 minute battle ended, and Myron handled it all perfectly! Jeff told us afterwards he checked the reel and found they’d only had about 15 yards of mono to work with. Can you believe that?! 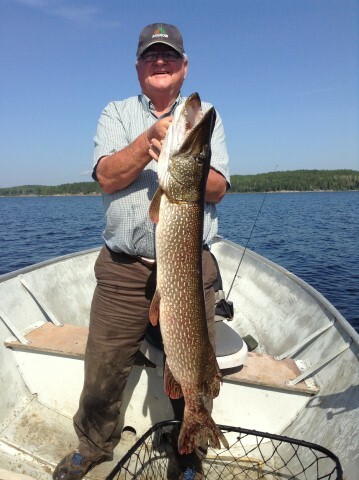 Check out Myron’s 40″+ trophy Northern Pike in the photo!